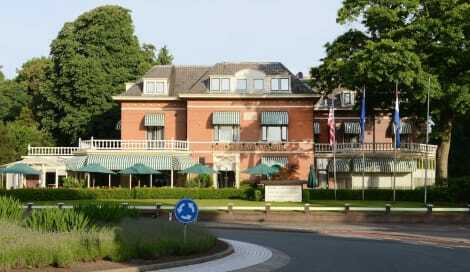 This newly renovated 4-star hotel in the city centre of Hilversum, is situated in a national monument. Hilversum Media Park can be reached within a 5-minute drive. Hotel Gooiland benefits from a terrace, ice cream parlour and 24-hour reception. The hotel offers free WiFi. All of the rooms at Hotel Gooiland feature a flatscreen TV and work desk. Each bathroom is equipped with a rain shower and hairdryer. There is air conditioning available and Nespresso coffee- and tea facilities are provided. The rooms are equipped with brands and designs from Dutch origin. The main shopping area is 300 metres from the hotel. Hilversum Railway Station is just a 10-minute walk from Hotel Gooiland and getting to the centre of both Amsterdam and Utrecht takes only 20 minutes by train. With a stay at Tulip Inn Media Park Hilversum in Hilversum, you'll be a 4-minute walk from Raadhuis and 8 minutes by foot from The Netherlands Institute for Sound and Vision. This hotel is 19.5 mi (31.3 km) from Ziggo Dome and 19.7 mi (31.7 km) from Amsterdam ArenA. Enjoy a meal at the restaurant, or stay in and take advantage of the hotel's room service (during limited hours). Wrap up your day with a drink at the bar/lounge. Buffet breakfasts are served on weekdays from 7:00 AM to 9:30 AM and on weekends from 8:30 AM to 10:30 AM for a fee. lastminute.com has a fantastic range of hotels in Hilversum, with everything from cheap hotels to luxurious five star accommodation available. We like to live up to our last minute name so remember you can book any one of our excellent Hilversum hotels up until midnight and stay the same night.